With your first bite on this Crispy Pork Belly, you can hear satisfying crackles of the skin, followed by the lip-smacking fat layer. You can’t imagine such heaven-sent pizzazz on a plate. Pork is the meat in China. The words ‘pork’ and ‘meat’ share the same Mandarin symbol. 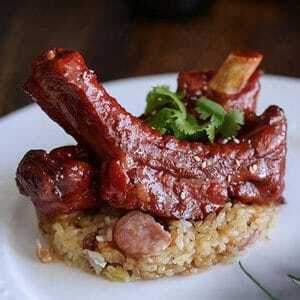 It is said good Chinese cooks know 100 recipes for pork. 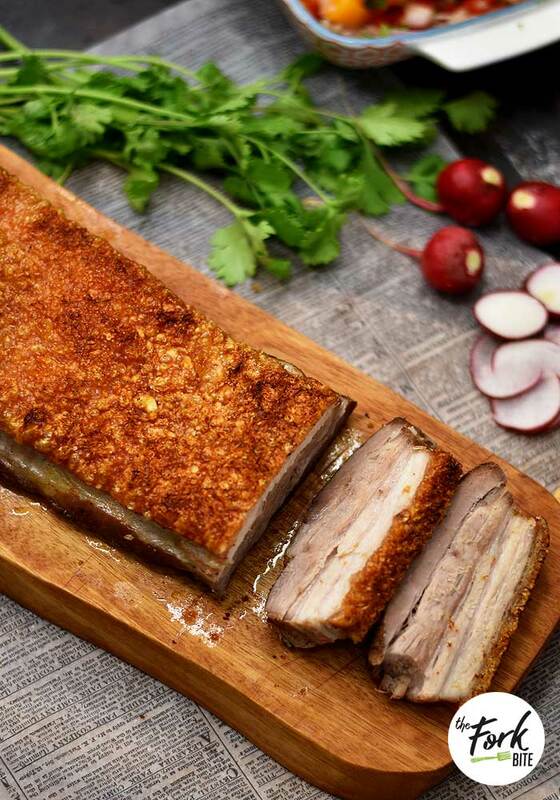 Our recipe of the day is Crispy Pork Belly. Now, if you are non-Chinese, you’re gonna rock pork belly, because it’s like a luscious slab of bacon. 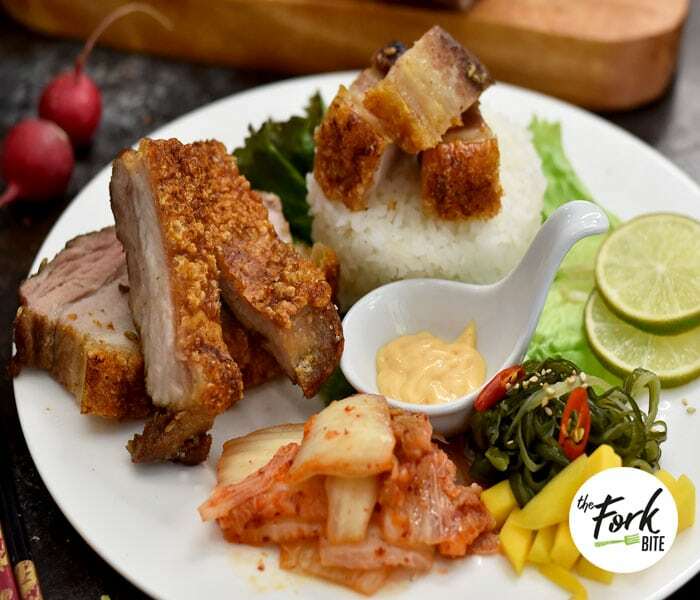 Where pork belly is a big hunk of fatty, non-cured, non-smoked pork; bacon is cured with salt, smoked and cut into frying-sized slices. What Puts the Crispy in Crispy Pork Belly? On one side, pork belly has a thick covering of fat and skin. By spreading an outer layer of rock salt on the fat side and baking, the salt crystals will puff up to make a crispy, crunchy crust. If you’ve ever eaten pork rinds or cracklins’, you’ll have some idea of its texture and taste. But, until you’ve eaten crispy pork belly fresh from the oven, you can’t imagine such heaven-sent pizzazz on a plate. Take a moment to inhale its pleasing aroma. Admire the golden crust and whiteness of the pork meat. With your first bite, hear satisfying crackles of the skin, followed by the lip-smacking fat layer and melt-in-your-mouth Chinese roasted pork belly. Just the thought of this pork sets my mouth water. 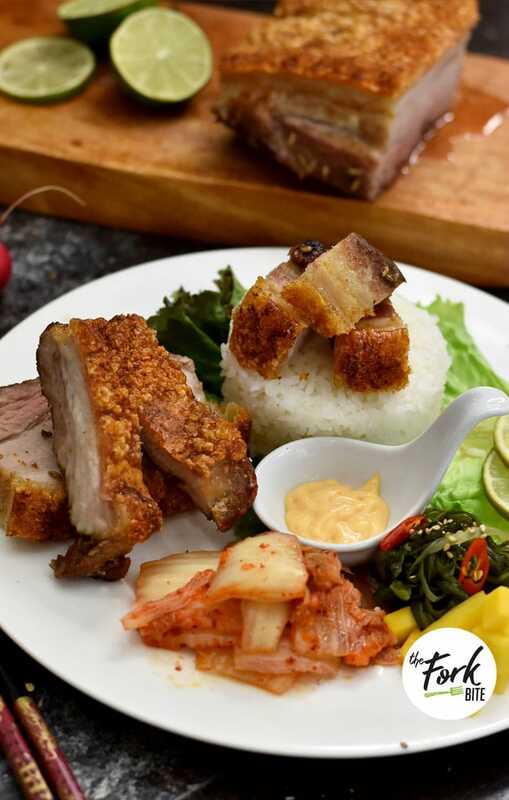 Finally, the to-die-for sensation when you bite into the mouthwatering pork belly meat. Tastes balance and blend like a happy marriage. Americans don’t share Asians fancy for pork. It’s rather an acquired taste. Best taken in small doses. 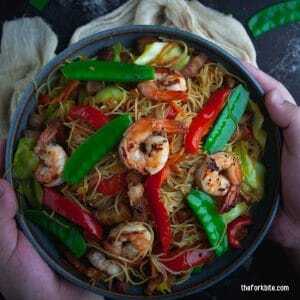 The secret of Chinese chefs is out! You can make Crispy Pork Belly at home if you put your attention on proper techniques. It’s vital to season and refrigerates your pork belly overnight, prior to cooking. ① The secret to a golden, puffy crackling is to prick lots or tiny holes in the skin (only). But don’t worry, if unintentionally, you prick the fat under the skin or perhaps even the flesh, this may cause juices to bubble to the surface which may result in some splotches that are not 100% crisp. ② The key to even golden crackling is not to put your pork belly dangerously near the source of heat, the farther away it is, the better. Don’t rush the baking phase. Underdone pork can be hazardous to your health. ③ And of course, the Rock Salt – the salt crust not only draws moisture to the surface for ultra crispy skin, it also ensures it is perfectly seasoned. Pork belly is better as starters because it is extremely rich. Leftover, cold pork belly, is not so palatable. Feel free to reheat the lean pork meat, but first, separate it from fatty meat and crackling. Remember, when reheated, the fat meat will take on a rubbery texture and cracklings lose their crunch. You can reheat the meat into the oven or microwave while you can put the crackling under the grill (aka broiler), or a toaster oven; the dry heat will prevent the skin from getting chewy. Crispy Pork Belly is spot on for important guests. Enjoy! Use the edge of a knife or another tool to prick lots of holes in the skin. Be cautious not to pierce into the fat or flesh. Turn the pork belly upside down. Rub the flesh (not skin) with Chinese cooking wine. Sprinkle over the cumin, fennel seeds and five spice powder. Rub all over flesh (not on skin). Turn right side up and place in a container. Dab skin dry with paper towels. Refrigerate uncovered for 12 hours (or overnight). Remove pork from the fridge. Place in a large sheet of foil. Fold up sides of foil around the pork to enclose it snugly. Transfer pork to baking tray. Dab skin with paper towels. Brush skin with vinegar (this helps conduct heat evenly). Spread rock salt on the skin. Remove pork from the oven and transfer into work surface. Switch to grill/broiler on medium high. Move shelf so it is at least 12" from the heat source. 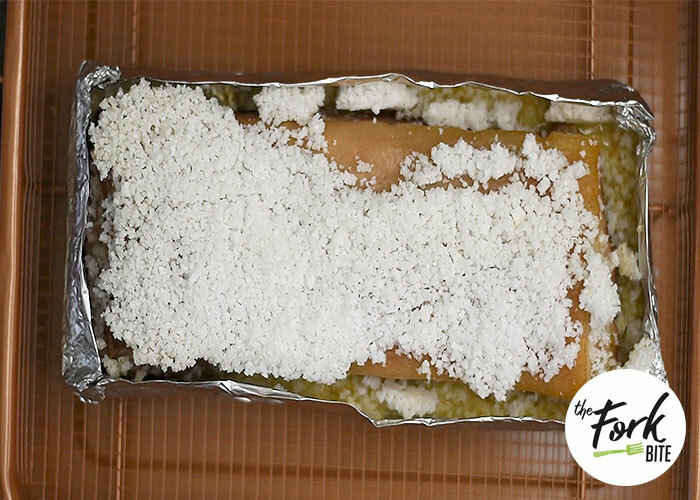 Fold down foil and scrape all the salt off the top and sides. Return the pork only (discard the foil) to baking tray. Place under grill/broiler for 20-25 minutes, rotating the tray once or until skin is golden, crispy and puffed. Slice into thick slices (bite sizes). Serve with ordinary mustard or your favorite dip. 1.) Rock Salt – the salt crust not only draws moisture to the surface for ultra crispy skin, it also ensures it is perfectly seasoned. I love this golden, crispy skin of pork. 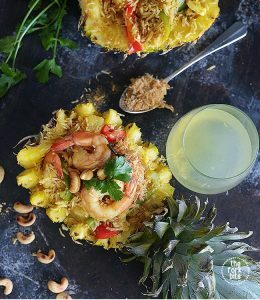 Thank you for figuring out the recipe in a simpler form.. Cant wait to try this on weekends.. This will be my second time to attempt recreating this pork belly. It didn’t turn out pretty good the last time but now, I’m going to follow your video. Your recipe is not more labor intensive, so I will get it a try. Did you use regular salt or bigger chunk of salt to sit on the skin? 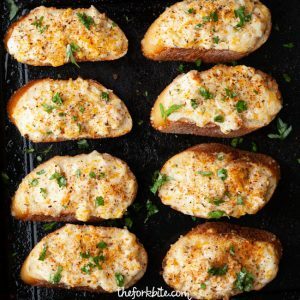 Can I use air fryer for this recipe? I’ve had this in a restaurant, but never tried making it at home. Yours looks delicious! I love love love pork belly. I used to get it all the time at this Japanese restaurant in Brooklyn. I’ve never made it at home though. Thanks so much for these detailed instructions! Awesome tips. This is the same method I use to crispy up the skin on a roast duck or chicken. Also to cure salmon. Never thought to try it on pork belly with the rock salt. I must try this! For all Pork Lovers, this dish is going to be amazing. I want to grab a piece of it right away. Sure to be on my Christmas Dinner Table this time of the year. Delicious. wow, that pork belly looks incredibly good, I am a fan of crispy pork belly or chicharrones as we call them in Mexico. You cannot go wrong with serving such a delicacy. Thanks for the tips too! Looks so delicious and crispy! Can’t wait to try this recipe soon! Wow, this looks amazing, I am adding this to my bucket list which I have to do before 30. Thanks for inspiration. I am going to try this recipe. I love pork cracklings! I did not know that poking holes on the skin would do the trick! 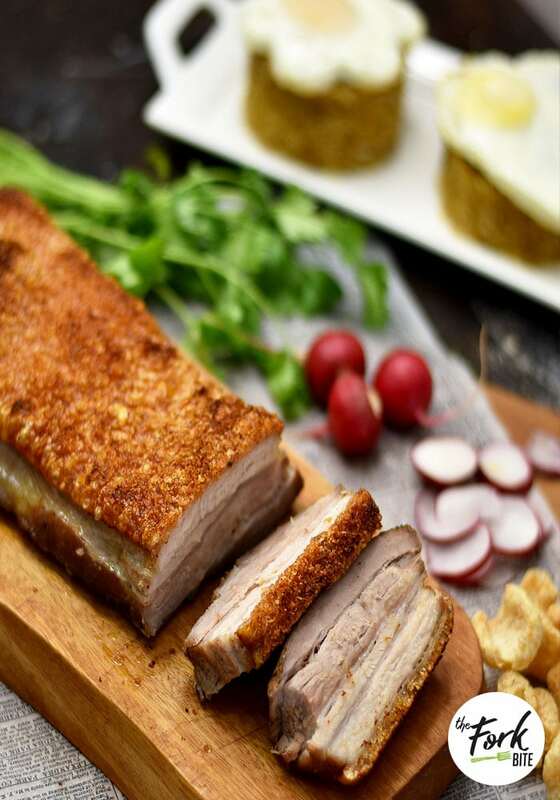 Thanks for the tips on how to make a perfectly crispy slab of pork belly! Great tips you’ve shared here, never knew the use of Rock salt in such recipe’s. Good try for many people out there! This is a mouth-watery post! 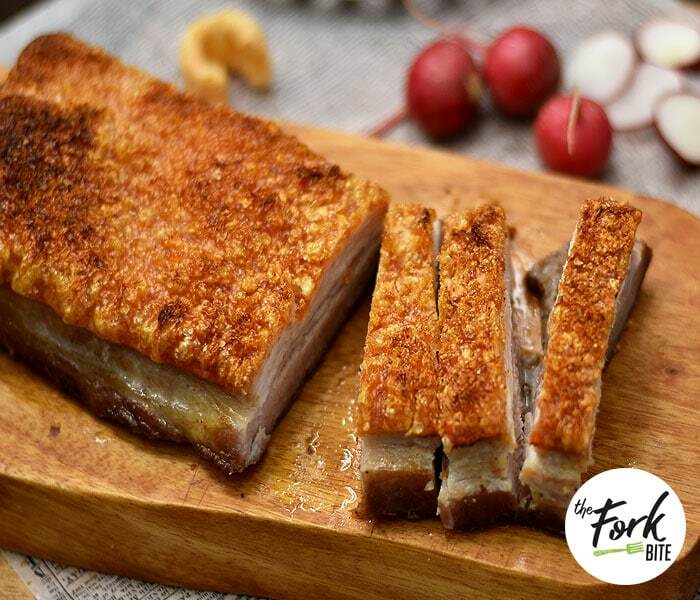 Crispy pork belly is really delicious – this is one of the crowd’s favorite in my country – so they play many variations and flavor on it too, one the most popular is called “Bagnet” – you should try it. Every asian favorite! O M G! Makes me thinknof noodle soup with pork crispy porc belly on top. Will I dare to make it myself…I think I will! I swear rock or sea salt as I call it makes anything taste 10 x better. It looks like you took great care in making this pork belly and have shared your trade secrets with us. Thanks! Super informative post! love that you included the full recipe with a printable version at the bottom, very helpful. Looking forward to more recipes! Well I am not a Non-Veg Eater. But I will go by your blog. You explained well and you also gave recipes. So People should bookmark it. ah yes, pork belly is a staple in filipino households. this reminds me of birthdays,holidays, and family parties. we normally just order ours because if we cook it too much, we eat it too much and its super unhealthy! Yum I love pork And have always wondered how to get that perfect melt in your mouth crispy texture. I have never tried it this way, but look forward to sharing it with my mom. It’s one of her favorites! Looks delicious! Can’t wait to test my skills at this…and can’t wait to get a taste of this!!! This looks and sounds really good! Rock salt huh? That is very interesting…I’ll pin this for later so I can try it. Thanks for sharing! this looks so good, I do love crispy pork belly. It really doesn’t take much to fill you up does it?! I think I am in love! 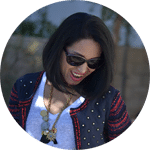 I had to pin this recipe because it seems like I am going to have to make up an excuse to make it some time. I love your tips about docking it and using salt. I wouldn’t have ever guessed! I have always wanted to try pork belly! Now I know the Ancient Chinese Secret!! Thanks for the inspiration! Great tips on how to cook a pork belly! I never knew that about the salt. I’ve never seen a page with a recipe for this. You are very talented! 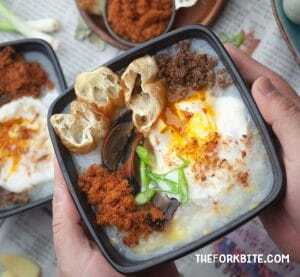 This looks so good and I must try this ASAP! Thank you for sharing your tips! I have never cooked a pork belly. You make it look less intimidating. This looks soo good! I wish I could reach through and grab a bite!! !